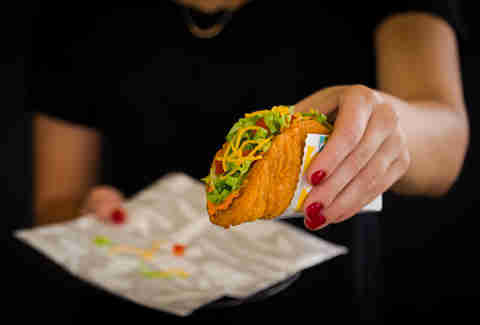 When Taco Bell discontinued the Naked Chicken Chalupa -- you know, the insane taco with a shell made out of fried chicken -- after a limited-time run early last year, the fast food chain strongly hinted it’d only be a matter of time before the stunt food would take your digestive system by storm again. Well, just a little more than a year later, it looks like that time has finally arrived. Prepare yourself. 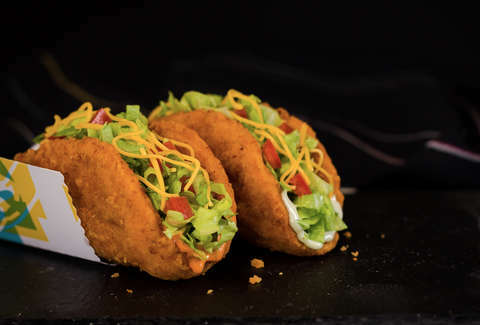 "The original Naked Chicken Chalupa is spicy in its own right with an all-white meat, raised without antibiotics crispy chicken shell, kicked up with bold Mexican spices and seasoning and packed with shredded lettuce, tomatoes, cheddar cheese and creamy avocado ranch sauce," the chain said in a press release. "But the new Wilder Naked Chicken Chalupa takes the heat to the next level. Complete with the same crispy fried chicken shell and fillings, the wilder version is topped off with a bold, smoky Wild sauce that is bound to warm up taste buds." In other words, the OG NCC was kind of spicy, but the "wilder" version is even spicier, thanks to the addition of the new Wild sauce. Even wilder yet is an ultra-cheesy take on the taco that's only available as part of a test launch in Cleveland, Ohio, the Nacho Cheese Naked Chicken Chalupa. If all goes well, that version will also hit menus nationwide some day. Both the Naked Chicken Chalupa and the Wilder Naked Chicken Chalupa go for $2.99 apiece or as part of a $5 Box that includes an NCC, a Doritos Locos Taco, a Crunchy Taco, and a medium drink, according to Taco Bell, although prices tend to vary depending on where you live. The chain didn't mention how long the triumphant comeback will last, but it's probably safe to assume you'll have at least a couple of months to get your hands on one like with the big debut last year. If not, you'll just have to wait for the Even Wilder Naked Chicken Chalupa/Wildest Naked Chicken Chalupa -- or whatever the hell they end up calling the next one. Tony Merevick is Senior News Editor at Thrillist and always goes for the spicy option at most fast food restaurants. Send news tips to news@thrillist.com and follow him on Twitter @tonymerevick.